It is my understanding that this does not include the claim for the Tongariro National Park which will be negotiated separately. The New Season Taupo Fishing License. I was impressed this year with the ease I had to purchase on line my new season license. I bought a family license as I usually buy each grandchild a season license. I am pleased with this license this year as the grandchildren are too young to wander off by themselves along the river. I have at this time only the electronic license in which my wife and I are named as the two adults and each grandchild is included on the one license and so I don’t know if if the 6 of us will get individual licenses or whether I will have to make copies for all. At this time all I have is the receipt on my cell phone. July 1 was a miserable outside day. Rain and cold. That evening watching the test I was aware that while raining in Wellington it was raining heavily here as well. We got 65mm overnight which saw the river reach 297 cms (normal is 23cms). The river rose quickly and went down equally quickly. I fished late Monday afternoon and it was a great experience with fish taking every couple of casts. The walk from the Baib carpark to the Reed Pool has a well established track. Near the Reed the track is very close to the river. 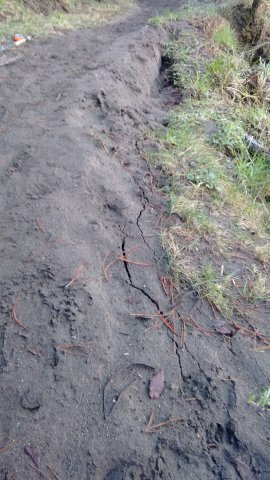 Last weekends flood has exposed cracks that will see the bank in the river and a new path made. I have been surprised at how well the banks have held up. There are signs in some places of erosion of the river banks but I am intrigued given that the banks are recent sand build up at how little erosion has occurred. There is a cabbage tree trunk being exposed indicating the huge amount of deposition that has occurred. In a couple of places shrubs just above the water level are a cause for bank erosion. Just on dark I realised that there another angler had come into the pool upstream of me. I called time on my fishing and as I walked back I saw that the newcomer into the pool was spin fishing. In Talking with him e was unawre that the river was fly fishing only, that he had to have a fishing license and that 2 triple hooks attached to his lure was also illegal. He was a young Argentine tourist and wanted to know why these rules were in place. We had a short discussion and I left him alone in the lower river. I did not have my cellphone with me. At the car park I met Didymo Dave, recounted the event and he contacted the ranger. It made me consider what more I could have done and the short answer was that I could not have done more.